The definitions of yoga vary, but you will generally find a few key components: postures, breathing, meditation, spirit, health, mental clarity, etc. We find it more important to understand balance in terms of a condition in which different elements are equal or in the correct proportions. Correct balance is what makes a complimentary program. Every day, our class starts with stretching and mobility; the remainder of class is an organized strength and conditioning regimen. Thus, our yoga class is complimentary. It will not always be an easy, laid-back stretching routine. In fact, many of you will conclude the class is rather challenging, physically and mentally, but in different ways than the Humble Beast CrossFit program is. The placement of the yoga class is at the end of our “load” micro cycle (week) and before the longer Saturday WOD. This was not accidental, it was intentionally so. 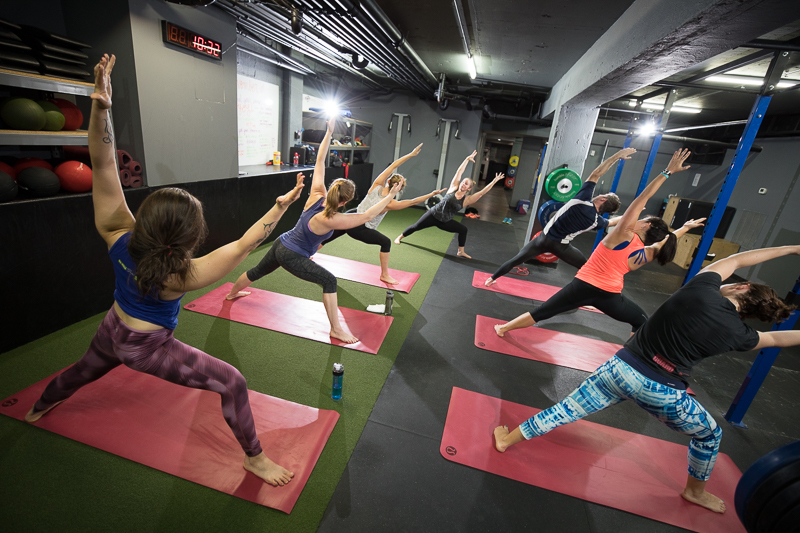 Taking the Humble Beast CrossFit class after yoga on Saturdays is completely possible. Will it be hard? Yes. Will it still provide balance? Yes. Please do not look to our yoga class to be some sort of out of body experience, meditation or religion, but rather, a physical means to compliment your daily workweek. Our yoga class starts promptly at 10 a.m. and all access to the class will conclude once class begins. Our instructors are trained and experienced in different disciplines and utilize their knowledge and experience with both yoga and CrossFit to provide a yoga class that compliments our Humble Beast CrossFit program regimen. August Mobility Month: Roll Out! It's the final week of our August Mobility Month! This week we want to address an area that we have not yet emphasized due to the fact that it’s in the one place that you are so often held accountable: the gym. Moving forward let’s add foam rolling into our pre-stretching routine. Foam rollers are used to mimic myofascial release techniques in order to increase range of motion (ROM). The roller-massager was designed to serve a similar purpose, but it's a more portable device that uses the upper body rather than body mass to provide the rolling force. If you read this PDF, you will see that foam rolling has been argued to increase ROM by 4.3%! In terms of rolling, our preferred approach are the troubled areas. Roll with pressure, slowly, until you find areas of tension or “pain”. Three minutes per area is the usual prescription.We have two main rollers at Humble Beast CrossFit: the softer, introductory foam roller and the stiffer, less forgiving grid roller. Coach Jeff tends to “roll out” twice, sometimes three times daily. He will target the same areas over and over until the tension or pain from application diminishes from sometimes an unbearable level, to a comfortable or more comfortable level. If you're looking to acquire your own convenient roller to add to your gym bag and/or home, Amazon.com has a great option. By the end of this week, you should have formed a pretty solid set of habits in body maintenance consisting of morning movement to get blood moving and wake up your joints, work related body maintenance in a seated or standing position, pre-WOD enhancements via pre-stretch foam rolling at HB, and PM pre-bed mobility. If you're actively doing these and still have muscle/joint aches and pains, let the Humble Beast staff know but, please make a routine out of muscle/joint maintenance first! Take care of your body, it's only one you are blessed with! It's week three of Mobility Month! Hopefully you have been working diligently on your techniques and in return life is getting easier! The things we have noticed that have become easier is putting on socks, randomly squatting to crack knees, and WODs. Morning: Down dog and knee to head stand - but let’s add some reps! Try to get into this movement for up to 5 minutes. Work: Wall bridge and seated hip stretch. Let's also add a standing back bend. Put your hands on your bottom, raise your chest up and bend backwards. Home: Add a deeper hero pose to the end of your evening. If you watch TV, challenge yourself to watch commercial breaks in stretching positions. Otherwise, spend a little more time taking advantage of your post-shower body temperature and get a good 5-10 minute routine in right after. Remember, we are trying to form good habits. Keep up the good work! August Mobility Month: Let's Add a Little! Practice these techniques daily and try to hold them in a longer, more gradual state rather than rushing to finish the range of movement (ROM). If you are limited on time, alternate last week’s techniques with this week's techniques for your ROM sessions. Practice, practice. Remember, if you don't use it, you'll lose it! August 2016 is going to be “Mobility Month”! This does not mean that during the month of August you should only focus on mobility, but rather, use this month to truly figure out what mobility techniques work best for you and how to incorporate them into your daily routine! • Start your day (morning) with 5-10 mins of mobility. Every little bit counts, fam! • Take 3-5, 5 minute breaks during the work day OR sneak in 5 minutes, 3-5 times into your seated/standing desk routine. • Get to the gym on time to maximize all 10 minutes of the mobility portion. • Finish your day with 5-10 minutes of mobility before bed. Each week we will give you a few techniques to focus on. Do these daily and you will really notice a difference! Morning: Up-dog/down-dogs; start slow, hold the poses for 20-30 seconds x10 reps. Rest/breathe, brush your teeth and come back again for a little faster intense pace 10-20 seconds x10 rounds. This should take a total of 7-8 minutes. Work: Wall-back bends. They’re back! Enjoy them and do them! Do 5 at a time for 10 seconds each x3-5 breaks. This should take a total of 3-5 minutes. Do them 45 minutes to an hour apart. Evening: Gently work on your splits while watching TV or listening to relaxing music, or heck, even meditate while doing it. Give yourself 3 FULL 3-minute attempts!